The global Circulating Tumor Cell, CTC, market has been estimated to be $3.7 billion in 2013. That is bolstered by over 400 on-going clinical trials worldwide. This market is expected to grow to almost $9 billion in 2018. There is only one FDA-cleared technology in the USA for CTC selection in the clinical laboratory, Veridex CellSearch® System by Janssen Laboratories. CellSearch® has been approved for use in breast, prostate and colorectal cancers. However, this system has several limitations including modest recovery, high test cost and low purity of the CTC selected fraction. In addition, its implementation in clinical laboratories generates modest clinical sensitivity and specificity. BioFluidica's patented technology and test format significantly improves upon the performance characteristics of CellSearch® by generating higher recoveries of rare CTCs, lower test cost and high purity, providing the ability to perform downstream molecular processing. In addition, BioFluidica's CTC selection technology is currently being integrated to patented technologies for the isolation of cfDNA and exosomes providing an unprecedented capability of performing a complete liquid biopsy from a single blood sample using a fully automated platform. BioFluidica uses a dual-selection process to capture CTCs that results in higher clinical yields compared to a selection process using only a single antibody, as is done in existing commercial systems. 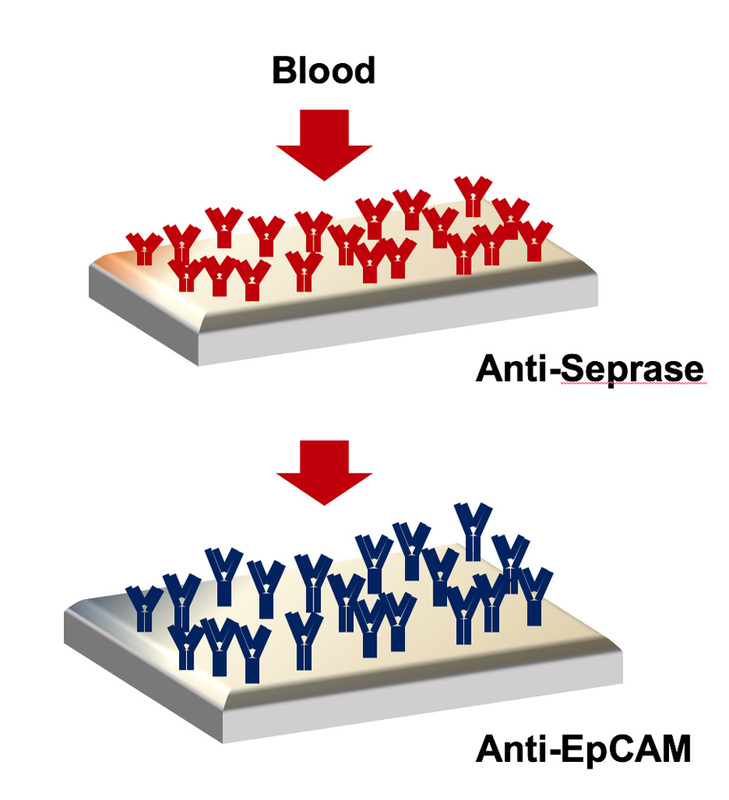 The dual-selection process uses the common epithelial marker, EpCAM as the selection antigen, which is used in existing commercial systems, and also uses seprase as the selection antigen. Seprase, which is a marker of non-epithelial cells, is expressed in CTCs that cannot be captured using EpCAM as the selection antigen only, increasing the CTC clinical yield from a single blood sample. BioFluidica has found that in over 90% of cases, CTCs that express seprase do not express EpCAM. Also, the seprase CTCs have been found to be more plentiful compared to the EpCAM CTCs in many pre-metastatic conditions opening the door for using CTCs as a biomarker for early detection of many cancers. Fig.1 Biofluidica's dual selection technology. BioFluidica has used its technology to generate pure fractions of CTCs that can be used for molecular profiling, thus providing clinical information that is not available from simple CTC enumeration data. For example, CTCs have been isolated from colorectal cancer patients and their KRAS mutational status has been determined prior to receiving anti-EGFR monoclonal antibody therapy. The high clinical yields as well as the high purity of the isolated CTC fractions provides the ability to determine the KRAS mutational status directly from genomic DNA secured from the CTCs acquired from the blood samples of colorectal and pancreatic cancer patients, even for pancreatic cancer patients that have localized disease. Using the BioFluidica cell analysis technology also allowed for mRNA expression profiling of the captured CTCs; this was made possible because of the high purity of the isolated CTC fractions. In addition, BioFluidica’s technology has been used to provide genomic DNA for next generation sequencing (NGS) using the Illumina platform. Because of the high purity of the isolated CTCs, single cell sequencing was not required, but still providing high quality sequencing data. Besides solid cancers, BioFluidica's technology can be used to isolate cells from other types of cancers, such as multiple myeloma. BioFluidica’s technology was used to isolate circulating multiple myeloma cells, CMMCs, from patients with various stages of myeloma disease. In this case, CD138 was used as the selection antigen for the CMMCs. Using the BioFluidica technology, CMMCs could be captured from the various stages of myeloma, MGUS, smouldering and active myeloma. In addition, the CMMCs could be released from the capture surface and counted using the electrical sensor with the CMMCs subjected to FISH analysis to search for deletions in Chromosome 13. This was performed with researchers in the School of Medicine at the University of North Carolina, Chapel Hill. The technology can also be used to search for circulating leukemic cells, CLCs, using the appropriate selection antibodies attached to the walls of BioFluidica’s technology. For example, in conjunction with researchers as the University of North Carolina, Chapel Hill, BioFluidica’s chip technology was used to detect the onset of relapse in acute myeloid leukemia, AML, patients. Three different types of CLCs were selected from AML patients and relapse could be detected nearly 40 days earlier than standard techniques that require multi-parameter flow cytometry from cells isolated from the bone marrow. BioFluidica's technology required only peripheral blood and could thus be carried out much more frequently compared to multi-parameter flow cytometry. BioFluidica's technology can also be used for other clinical applications where rare cell analysis is critical. For example, to isolate and collect fetal cells in maternal blood for molecular testing of the unborn infant, replacing amniocentesis. The technology could also be used to provide point-of-care testing of T lymphocytes levels in people with AIDS, providing a more effective way to monitor their infections. In addition, the technology may have applications in cell-based therapies including immunotherapy. It could also be adopted by homeland security personnel to detect biological warfare agents or by food and water safety officials for monitoring pathogens in food and water.